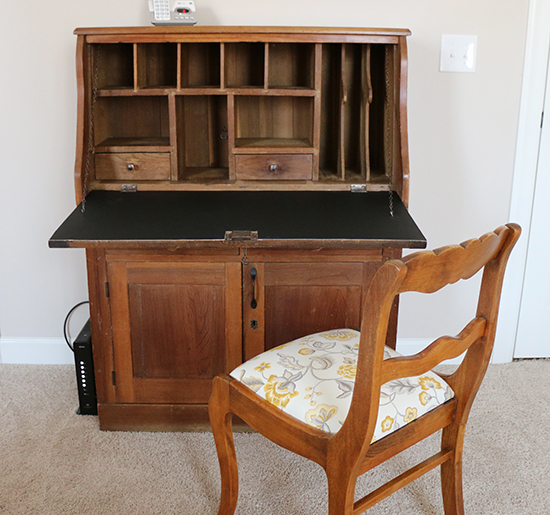 Last year, my husband inherited his grandfather’s office desk and chair. They’re not valuable antiques, but they bring with them happy memories of days when my husband helped his grandfather on the family farm. This fall, we were able to bring the set home. The desk and chair had sat mostly unused in an outer room for about five years, so the first step was a thorough cleaning and waxing. I didn’t know that so many spider eggs could be found on the bottoms of furniture! Checking the undersides of furniture will definitely become part of my cleaning routine. The next step was to spruce up the desk and chair. The general construction of the desk was sound, complete with dovetail joints, but some details were less so. 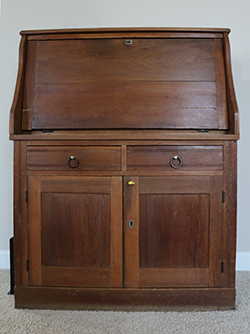 The exterior of the desk had two knobs on the drawers and a yellow plastic hook in place of a third knob on the cabinet door. We found some brushed bronze knobs with a subtle University of Alabama logo and a simple handle. 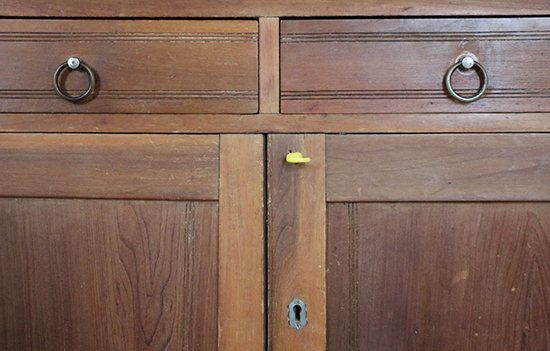 A lot of the old hardware had darkened over time, but the locks still held some shine. 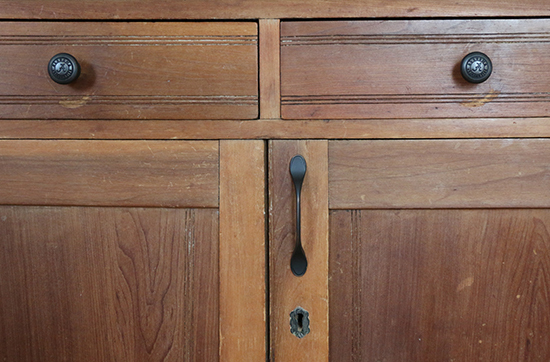 A light brush of flat black paint over the locks brought the hardware colors together. The original knobs had thick shanks that set into the wood, leaving a lot of wiggle room for the screws that came with the new knobs. 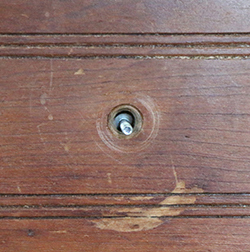 Flat washers stabilized the heads of the screws inside the drawers, while finish washers supported the ends of the screws and the knobs themselves by nesting into the holes from the outside. 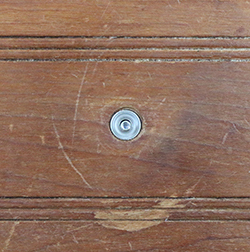 On the interior of the desk, two drawers had newer wooden knobs that looked out of place against the old wood and two basic L hooks were inside one cubby. Simple brushed bronze knobs replaced the wooden ones, and safety cup hooks seemed like a more secure way to hang important items such as keys. The faux leather writing surface, which covered the lock and hinges, was cracked and peeling. We replaced it with a piece of black vinyl — still going for the look of leather without the price tag — but cut around the hardware to avoid stretching the vinyl out of shape. With the desk complete, it was time to move on to the chair. We knew that the seat was in need of refreshed padding and upholstery. 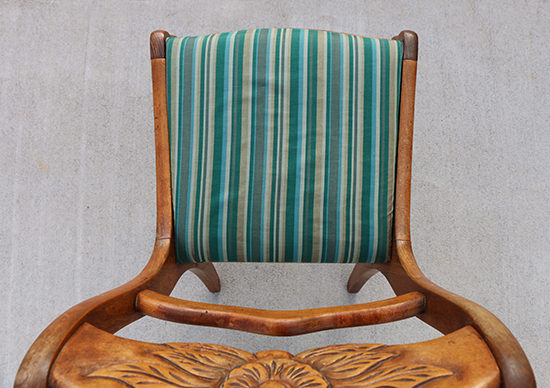 When we removed the seat, we found that the plywood base was delaminating, causing layers the wood to peel apart. After cutting and sanding new plywood, we stapled a lining over two inches (5 cm) of padding then stapled the upholstery fabric in place and reassembled the chair. We didn’t set out to choose a yellow upholstery fabric. 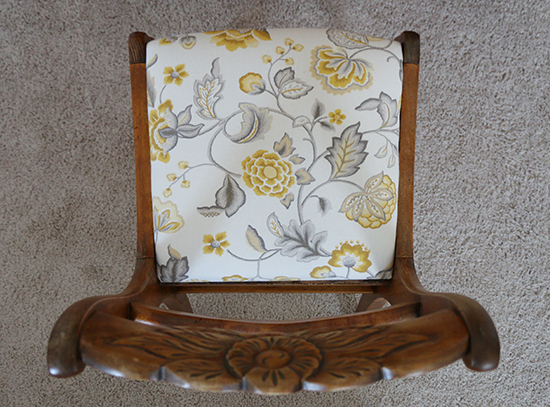 Between the vintage look of the print and the one flower that almost matches the carving in the chair back, we knew this fabric was the right choice. We made it through with only a few cuts and blisters, and are looking forward to using the updated desk and chair. The pieces have been made more valuable by the extra layer of good memories we shared in working together on this project. We're looking forward to using the desk and chair for years to come. They both look really nice. 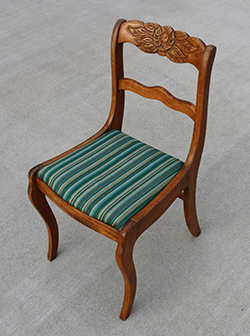 The fabric you used on the chair is perfect. Good Job! 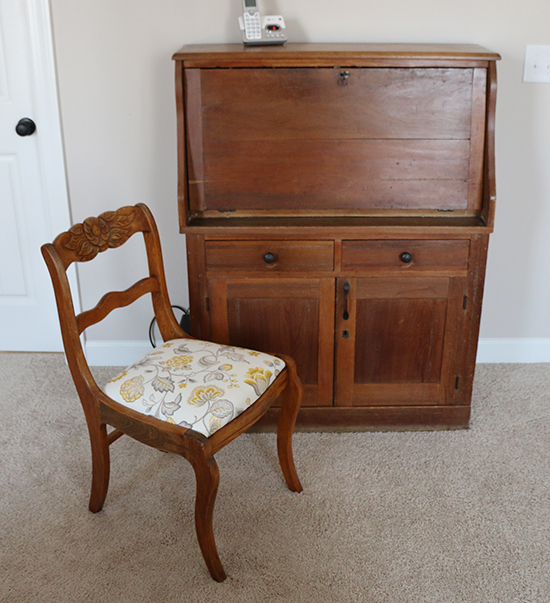 It's wonderful to be able to use furniture that has been handed down in the family! You did a great job making the desk and chair usable and good looking once again. Thanks for NOT painting them! I hate seeing that done to vintage wood furniture. Thank you, Annie! If the wood were in worse shape we might have considered painting the pieces, but I agree that these didn't need to be covered. Thank you, Melody! After giving the wood time to dry from a warm water cleaning, we polished it with a paste furniture wax. It's amazing how much extra dirt the wax removes, and it leaves the wood with a bit of a glow.